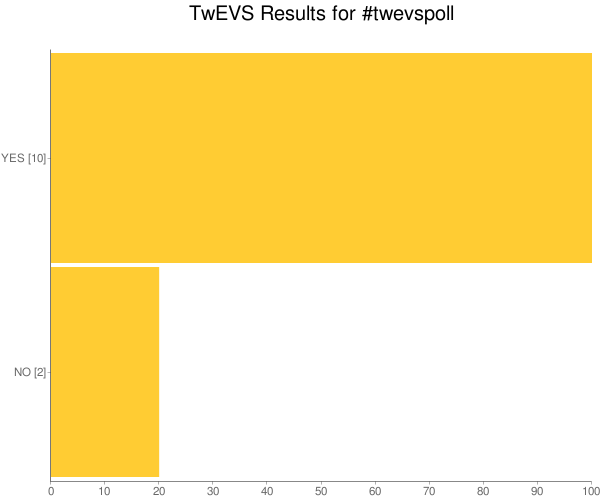 Last week I posted a method for combining twitter and Yahoo Pipes to allow electronic voting (EVS) style interaction within lectures, TwEVS [see Twitter + voting/polling + Yahoo Pipes = TwEVS (The Making Of)]. At the time I was only interested in documenting the development of this ‘mashup’ but felt a follow up post would be useful to highlight: how to use TwEVS; advantages of using twitter for student response; and areas for future development / discussion. Before using TwEVS there is some preparatory work in terms of getting students to register an account with twitter and possibly establishing some house rules (usage policy, appropriate use). You should also have an idea of the questions you would like to ask, which may sound simple but to fully engage and enhance learning isn’t (the most common mistake I see is setting trivial questions, which are suitable while you find your feet, but if continued will the students cue to disengage). Pedagogically and technically there are a number of ways you can integrate TwEVS. For more on the pedagogy visit Steve Draper’s ILIG site. My suggestion for technical integration would be to have a slide with the question/options and instructions on how to respond e.g. tweet ‘#CS101-09-wk1 A’ etc. After students had time to respond you could then either open the TwEVS Pipe in a browser, enter the hashtag where prompted then click ‘Run Pipe’ (you can also limit the number of response options, which might help filter out malicious tweets or mistypes). Clicking the ‘TwEVS Result for …’ link opens the graph. If you wanted to streamline this a little you can use the free LiveWeb PowerPoint plugin which allows you to embed live webpages. Alternativly you could prepare a custom link for each question within your PowerPoint (like this example). As Yahoo Pipes uses information in the url these could be created beforehand. The first part of this url will always remain the same allowing you to change the range of response by adjusting the limit (e.g. to limit to 5 would be limit=5) and the hashtag for each question, by changing the text after ‘q=’ (the ‘#’ is replaced by the more url friendly ‘%23’). Its worth noting that Yahoo stores a copy of each pipe run so when a pipe is run again before an allotted amount of time has passed it just pulls results from memory and doesn’t necessarily check twitter for the latest tweets. So if you are creating urls to use in class I would advise not accessing them until you need them. Alternatively you can also trick Yahoo into getting the latest data by modifying the url slightly, the easiest way is changing the limit number. Zero cost – the biggest advantage perhaps for the majority of people is cost. There are no handsets or specialist software to buy. You don’t need to worry about replacement batteries. You don’t need to worry about lost of stolen handsets. Multi-device – you can update your twitter status from a wide range of devices phones to laptops and everything in between (and using SMS updates means even the most basic phone could be used). Its also very apparent that manufactures are currently falling over themselves to get twitter (and other social networking software) built into their devices (my TV even has a twitter client). EVSPLUS – using twitter as a EVS allows a natural extension to existing pedagogies. For example, the TwEVS mashup is programmed only to aggregate responses after the hashtag. This means that as well as asking students to indicate a response (A, B, C, D etc. ), the tutor could ask students to prefix their response with why they believe the answer is correct. Using twitter to collect responses also opens up a huge degree of flexibility in terms of asking questions on-the-fly, removing some of the restrictions imposed by bespoke EVS software (and you are obviously not limited to A, B, C results). So far I’ve painted a rosy picture of twitter/EVS integration but there are some obvious issues. One of the biggest is there aren’t that many twitter users and even less under the age of 24. So to use this model would require proactive encouragement from tutors for students to create accounts. There is also issue around the personal/work divide. Will students be happy to include responses in their public timeline? Another drawback is voting isn’t entirely anonymous and students would even have the ability to check other student responses before replying (which is event easier if students follow their friends). The proposed system is also open to malicious attack. As everything after the hashtag is collected as a response students could get up to all sorts of hijinx to ruin your lovely chart. Finally something not to be overlooked is the possible distraction element of actively opening back channel communication, although I’m sure there will be situations where this could enhance learning, and giving students an excuse to get lost in their mobile phone. Putting all these issues aside for one moment, the model of using twitter as a EVS offers a lot of flexibility. As twitter’s search results can be pulled as RSS XML their is endless scope to harvest results and reuse them in a number of ways using either via in-house systems or existing web services. For example it would be very easy to develop a system which removed the dependency on Yahoo Pipes altogether, storing results in a separate local database which could be linked to a student management system or even a custom portal which allowed the continuation of discussion and learning outside the classroom. You also don’t need to only support just one platform, combining results from various status update sites like FriendFeed would be very easy to integrate. In summary, I hope I’ve stimulated the grey cells and demonstrated one way in which twitter could be used to enhance teaching and learning as a EVS alternative. TwEVS should should be seen as a working prototype and there is no doubt a lot more research to be done in this area. I’m sure with the hype associated with twitter it would be relatively easy to get some project funding to develop some of the ideas outlined above further. If you build a poll handler on your own server, I guess you could arrange to have students dm votes to your twitter account, and then pull the responses down to your server and process them there? Hmm direct messages could work (you would have to follow students, which leads back to the old issue of the divide between work and social). I’ve looked at polleverywhere before. For me you just don’t get enough for free. Twtpoll is another one but voting is taken outside twitter. I notice on the pipe page you gave it a nice URI? May be worth using that in the post? As one of the founders of Poll Everywhere, we’re always bringing new features and capabilities to Poll Everywhere and the free plan. The true nature of the free plan is to allow people to see, with their own eyes, that the product does what we claim it to be able to do. The 30 free responses has real monetary costs that we incur (in the forms of messaging, customer service, and other inquiries from free users about how the product works). Which aspect do you feel does not give you “enough” that you wish we had more of for free? If you mean the response limit on the free plan alone, realize that no other product anywhere on the web offers as much as we do for free, despite the very real business costs associated with providing free text messaging capabilities. If more responses was your biggest request and we gave it to you, would there be anything else we’d need to do to convert you to being one of our extremely loyal, paying customers? What would you like to see us offer you that you personally would actually pay for? If you’re just going to use it for free for the foreseeable future, that’s fine, too. I can’t guarantee we’ll add exactly what you want to the free plan but any suggestions to make it better are appreciated too. Free is a hard price to beat. You’re right, free is hard to beat (and hard to offer). There’s also enjoyment in doing things in a self-service fashion. In fact, that’s how Poll Everywhere is able to do live audience response even as cheaply as it can because of a pretty heavy emphasis on self-service (except if you do need help, we’re available, too). Thanks for taking the idea, and my thoughts, even further on this topic. I especially want to look at the methods you describe for embedding and reporting on the results. Compared to Poll Everywhere it is a crude tool but it works. For me the best part is that from a Tweet and a blog post along the lines of, “Is this possible”, you have now developed a working tool. Brilliant. A great example of the simple ideas being the best (and also an indication of the power of the crowd). You can get round cacheing on the browser by adding &randomjunk to the RSS/json URI (whre ‘randomjunk’ is generated fresh each time). Your computer dosn’t cache because each URI is unique.